Beläget i lugn Cala Carbo, med utsikt över den berömda Es Vedra. Den (barnvänliga stranden) Cala Carbo, Cala Vadella och Cala Tarida ca 5 minuter bort och vikarna som Cala Comte, Cala d'Hort på bara 5 till 10 minuter med bil. Den lilla byn San Jose på 10 minuters bilresa och huvudstaden, Ibiza Town i 30 minuter med bil. Stränder som Cala Jundal, Ses Salines och Talamanca inom en halvtimme bort med bil. Lägenheten ligger på en kulle och omges av andra utvecklingar och villor och gångavstånd finns en snabbköp och höftrestaurang. Lägenheten är mycket rymlig efter att ha kommit in i utsikten är fantastisk. Till baksidan av salongen finns en matsal och bioområde och det finns ett kök med ugn, kylskåp och separat tvättstuga. Genom skjutdörrar tillgång till terrassen, delvis täckt med havsutsikt till Es Vedra. Alla rum har egna badrum, gott om garderobsutrymme. Ett sovrum har en privat terrass. Det finns wifi och ipod ljudsystem. Amazing terrace and fantastic view! The whole place was great, bedrooms were nice, living space was good inside and outside was awesome. Location is close to the beach and multiple restaurants and markets. Rental agent was helpful. Would definitely stay there again if back in Ibiza. One of the best locations on the whole Island with majestic and breathtaking views of Es Vedra rising out of the sea where the sun falls on the large terrace from dawn till dusk. 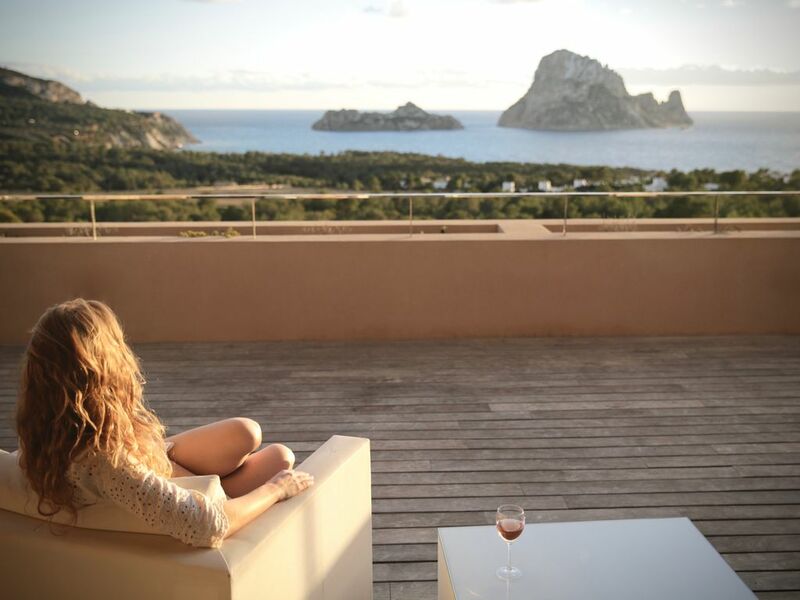 Sitting on the terrace with the views of Es Vedra during the day, or the stars at night is priceless. As a family of 6 with grown up children it was easy to get lost in this huge apartment, generous kitchen with all the facilities you could wish for if your self catering, with shaded eating space on the outside terrace, perfect for a relaxing week. Features include "Antarctic" chilled air-con, Pool table for matches in the big comfortable lounge, lightening fast Wi-Fi kept "the kids" happy. The enormous sofa big enough for everyone to sit on to enjoy the Plasma TV, music system, well stocked film library. You can also rest easy after a busy day of activities or doing nothing on the big comfortable beds, the area is quite and peaceful. Security is a feature of this apartment with the external door locking into the entire frame, all glazed windows lock securely, it is alarmed and has a safe as well. There are external gates to gain access to the apartment as well, we felt very secure during our stay. both in the apartment and leaving our possessions when out for the day. Sheina and her agent Fernando are great people easy to deal with and nothing was too much trouble, both booking the apartment and during our stay, we will definitely stay here again. In fact the truth be told we never wanted to leave it was such a great experience this apartment exceeded our expectations. The "Sardina Loca" local bar/Restaurant and Local well stocked SPA is only 5 mins walk away, with 6 people easy to carry all the shopping back, or go for a meal or two. Good food and reasonable prices. This holiday we decided to go "Car free" across the island and have a bit of a walking holiday using public transport, taxi's and water taxis across Ibiza. Our family are all quite active and enjoy outdoor activities we found that in this area Cala Vadella, Cala Carbo, and Cala d'Hort are all walkable. If you are wanting to get a taxi to another part of the island I would recommend using the "Sardina Loca" as the RV point, Taxi drivers know where it is. The Taxi company that covers this part of the Island can be reached on +34 979 80 00 80. This is by far one of the best places we have ever stayed and we would give it 10 Stars but there where only 5 to select, you will not be disappointed. We stayed here for a week in June, and were blown away by the view. The pictures really don’t do that view of Es Vedra justice. The apartment is clean, modern and comes complete with everything you need. The beds are comfy, there’s loads of space, and we felt very safe there. No one overlooks the balcony so it’s also very private. It comes complete with a parking space, and is also alarmed and has a safe. Not that we need worry - as the area is very quiet and secure but it puts your mind at ease. Sheina and Fernando who we dealt with before and during our stay couldn’t have been more helpful. We would thoroughly recommend this apartment to anyone. Eine schöne, sehr grosse Wohnung direkt vor Es Vedra. Awesome apartment with a magical view. November might not be the obvious time to go to Ibiza, but we had a blissful long weekend. It's a lovely apartment with a breathtaking, private terrace. Put an Ibiza chill-out playlist on the sound system and relax.